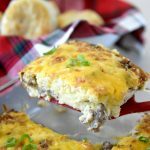 Bisquick Breakfast Casserole is the perfect breakfast recipe for a large crowd of family or friends! This savory breakfast casserole is full of sausage, eggs, cheese, and potatoes. This breakfast casserole post is sponsored by General Mills. All opinions are my own. The holidays are my favorite time of the year. These days we aren’t traveling as much during the holiday season unless it is to go up north to see my husband’s family for a day or two. What we are doing more and more of is entertaining family and friends at our home. I love hosting gatherings with my loved ones. It is one of the reasons we fell in love with this house five years ago. It was big enough to host parties and we haven’t had that in a long time… if ever. We have hosted my family when they visit from Idaho and it is so nice to have them here rather than a hotel. When we host guests I go into full planning mode. What am I going to make for meals? What am going to make for drinks? Am I going to theme anything? I just love planning it all out. Sometimes what I forget about during the holidays is to plan out breakfast meals. I find myself scrambling right before company comes making sure we have ingredients for breakfast. 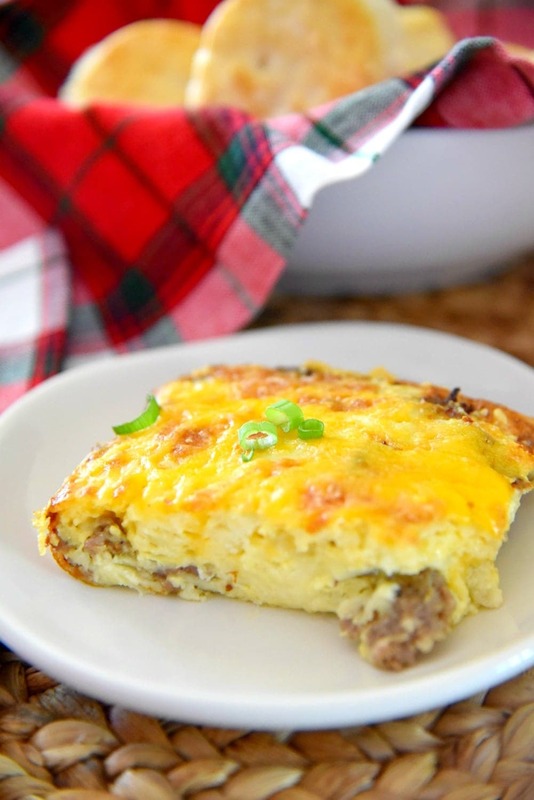 Feeding a large number of people easily and on a budget can get a little tricky, but today I am excited to share one of my most favorite recipes for holiday breakfast entertaining, Bisquick breakfast casserole! 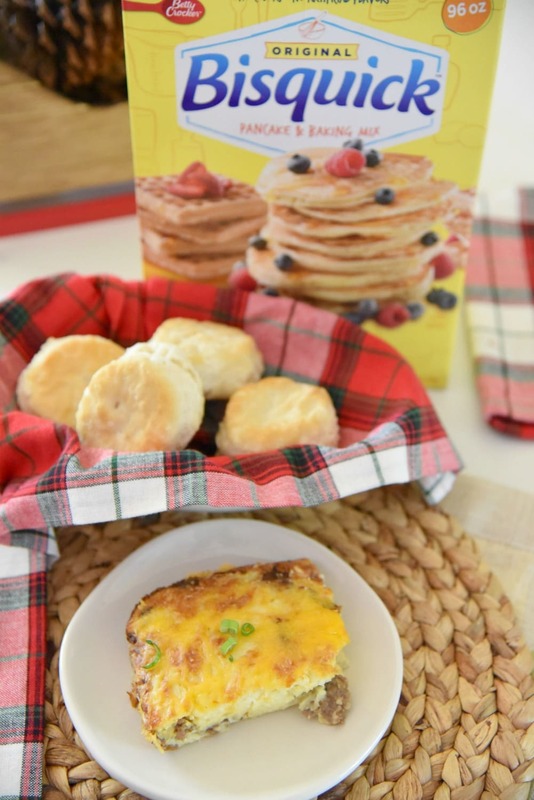 Bisquick Breakfast Casserole is a recipe I have been making for years. It is perfect because there are so many variations you can make with it once you have the main recipe down. I have made it with ham, I have made it with bacon, I have made it with leftover pulled pork… you get the idea. 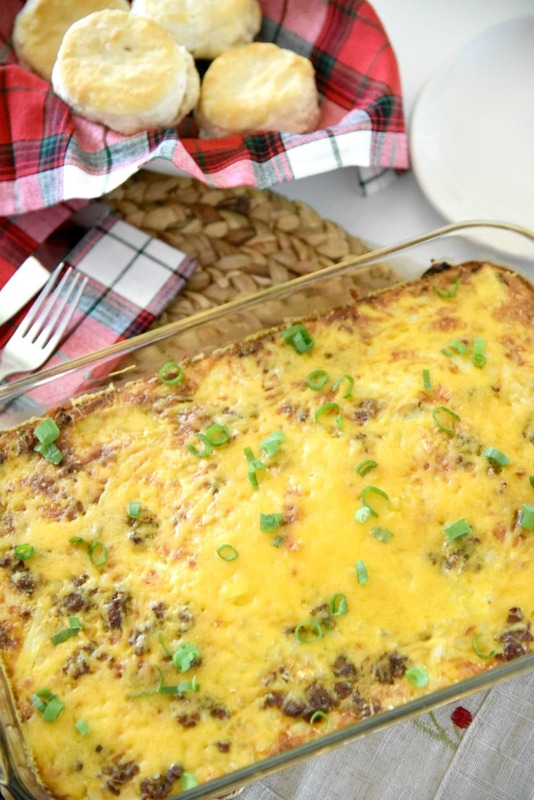 What I love to do for breakfast pitch-ins is to make a vegetable breakfast casserole and a sausage egg and cheese casserole like this Bisquick breakfast casserole recipe. It is important for me to always have product on hand during the holidays and that is why I get the large container of Bisquick from Sam’s Club. Sam’s Club is our go-to place for everything we need during the holidays. Sam’s has everything you need in the larger quantities you love. During the holidays I find all kinds of products that help me manage my time and make holiday entertaining a little bit easier. 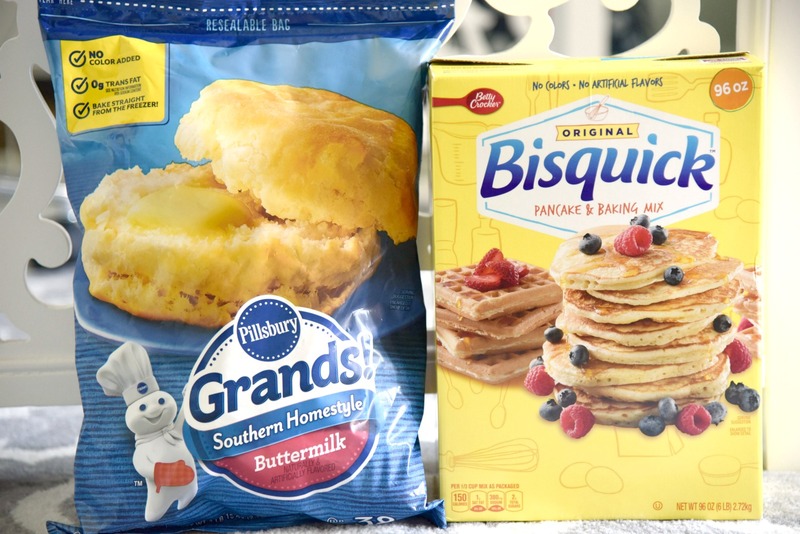 I always make sure I have a box of Bisquick and these Pillsbury™ Southern Biscuits in my home at all times. 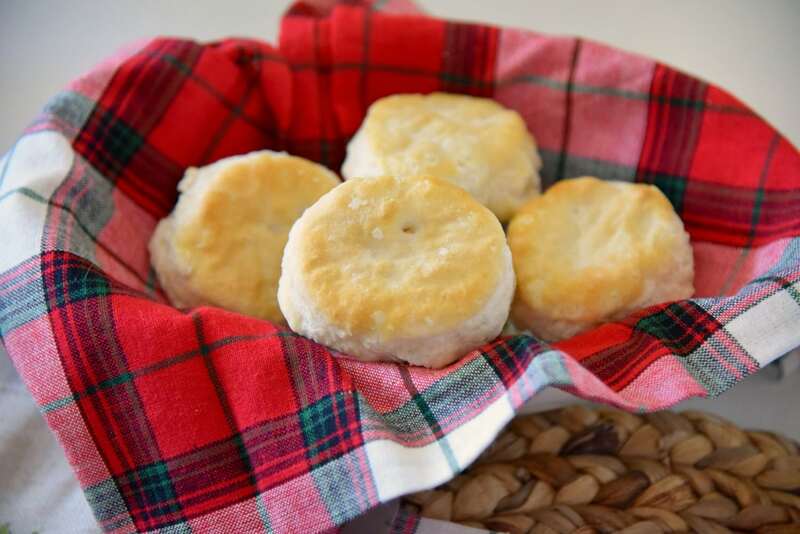 The biscuits are so easy to pop into the oven for breakfast, lunch or dinner. I have made biscuits from scratch and this is SO MUCH EASIER! Seriously… you need to have a bag in your freezer for the holiday season. You will thank me later. 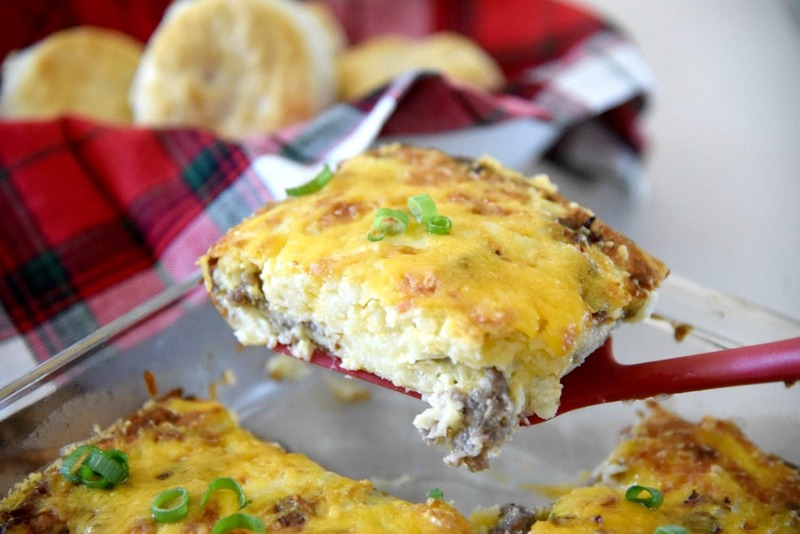 Back to making this sausage breakfast casserole with Bisquick. I made a short little video showing you how easy it is to make this breakfast dish. See… you can make dinner for a crowd in no time. The best part is that everyone is going to love it. I have brought this to work when we had teacher pitch-ins and I have gotten so many requests for the recipe. It is one of those recipes that you will make over and over again. So be the Merry Maker this holiday season and stock up for all your holiday needs at Sam’s Club! Preheat oven to 400 degrees. Cook sausage an onions in large skillet until cooked through and onions are translucent, drain. With cooking spray, grease a large baking dish, 13x9. Pour in sausage, hash browns, and 1 1/2 cups of cheese and mix well. In a large mixing bowl, stir Bisquick, milk, salt, pepper, and eggs together until well blended. Pour over the sausage mixture in the baking dish. Bake for 40 to 45 minutes uncovered or until the egg mixture is done in the middle. Sprinkle with 1/2 cup cheese and put back into the hot oven for 1 minute or until the cheese is melted. Sprinkle with green onions and enjoy! yes, After it has baked.